St. Francis of Assissi had a school formerly located on the west side of Newberry, opposite the church today. 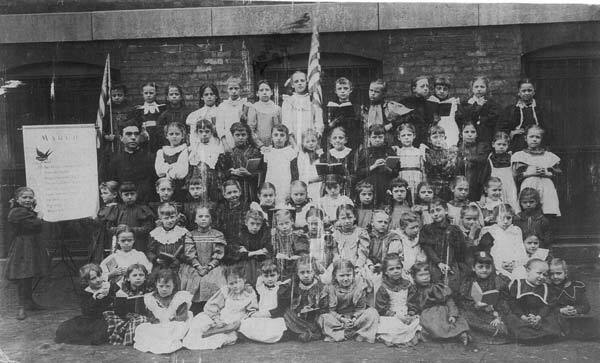 Anna Christiana Hoffman (identified in this photo as sixth from the left, top row), lived at 92 Newberry Avenue (1235 S. Newberry today), directly across from this school with her parents, John G. Hoffman and Mary J. Offer Hoffman. Her grandparents Christian Hoffman and Mary Ann Enzenbacher Hoffman lived on Newberry Avenue as well. The scan of this photo was donated by Barb Donahue in 2004. All images published by the Maxwell Street Foundation within this website are copyright of the artist and are for educational, personal, and/or noncommercial use only. For any other use, please contact gro.n1555620350oitad1555620350nuoft1555620350eerts1555620350llewx1555620350am@of1555620350ni1555620350.